Specialist engineers from BAE Systems are working with the National Museum of the Royal Navy on a unique project to help preserve HMS Victory, the world’s oldest commissioned warship, for future generations. The work will see engineers install a new structural support system for the ship, which is part of the most extensive restoration project of the 252-year-old warship following her repair after the Battle of Trafalgar. Ian Mcneeney, Head of Commercial and Business Development at BAE Systems, said: “We are privileged to carry on our continued support work on HMS Victory, Lord Nelson’s flagship at the Battle of Trafalgar and one of the UK’s most popular visitor attractions. Andrew Baines, Project Director at The National Museum of the Royal Navy, said: “HMS Victory is a unique museum object of international importance. This type of support is a first for any historic ship, and it’s essential we get it right. Since HMS Victory first docked in Portsmouth Naval Base, she has been supported on 22-steel cradles and a concrete plinth. 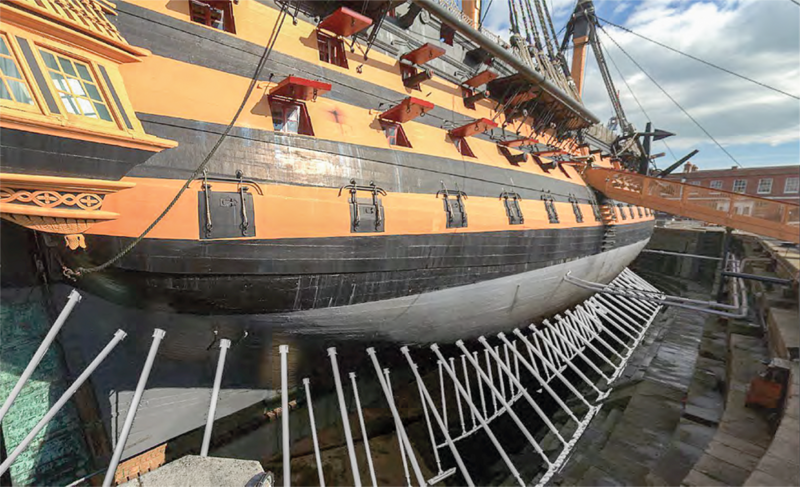 In order to preserve HMS Victory’s wooden hull, the existing cradles, which were installed in 1925, will be replaced with 134 precisely positioned props. The props will evenly distribute the ship’s load to recreate the natural stresses experienced on the hull when the ship was supported by water. The work to restore HMS Victory began in 2011, which included removing the masts and booms before work could begin to prevent water damage and reduce rot. The project has also seen the ship’s hull repainted and refurbishment of Admiral Lord Nelson’s cabin and the ‘Great Cabin’. HMS Victory is the oldest warship in the Royal Navy’s fleet and is the flagship of the First Sea Lord, Admiral Sir Philip Jones KCB ADC. She will remain open to the public as a visitor attraction during the restoration project which is due to complete in 2018.